Karen here and it is Make It Monday again! 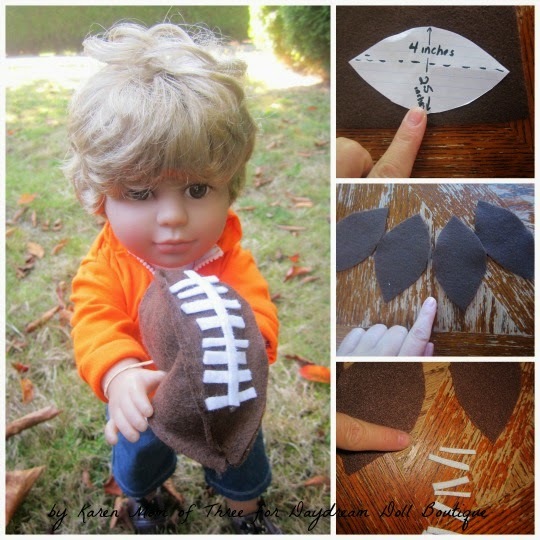 Today I am sharing how to make an easy Felt Football for your dolls. Step 1- Assemble all your supplies and draw shape on your paper that looks like mine above. Mine is 4 inches long through the center and 2.5 inches wide through the center. Cut it out this is your football pattern. Step 2- Cut out for pieces of brown felt using your pattern piece. Step 3- Plug in your glue gun and heat it up. Step 4- Cut out 8 1 inch long very thin strips of felt to be your stitches and one 2.5 inch long thin piece of white to glue over the stitches. Step 4- Run a line of glue down one edge of your felt shape and press another on top. Repeat on each of the felt until you have glued three pieces on. Step 5- Attach the last piece along one side as you did in the previous steep, leaving one side open to stuff. 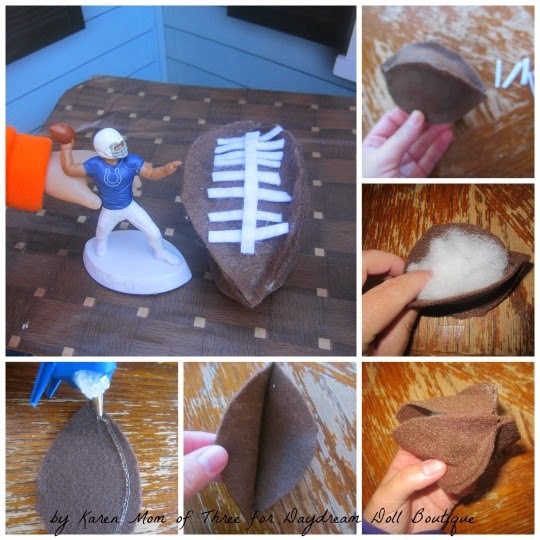 Step 6- Stuff your felt pocket and then add the last line of glue and seal your football. Step 7- Trim the edges of your ball. Add more glue if you happen to open the seams as you go. Step 8- Glue on the eight stitches and then Glue on the longer strip. Let dry. 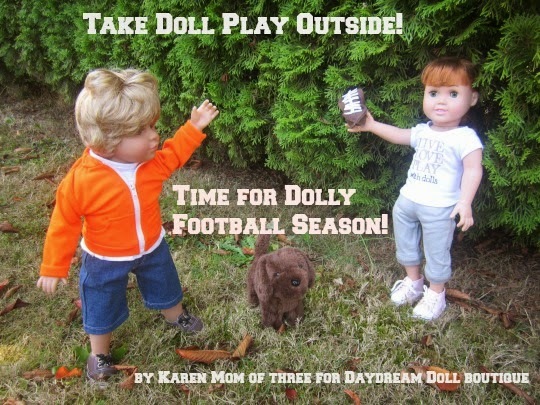 Step 9- Give to your dolls to play! I used a flesh tone elastic to get the dolls to hold the felt ball. 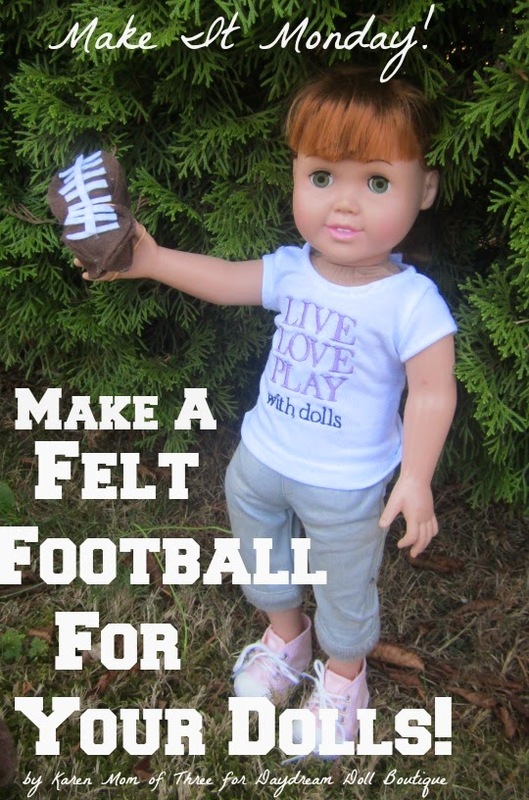 * The Football figures were in my son's happy meal from McDonald's and are perfect for doll play! I hope you enjoyed today's Make it Monday Post! 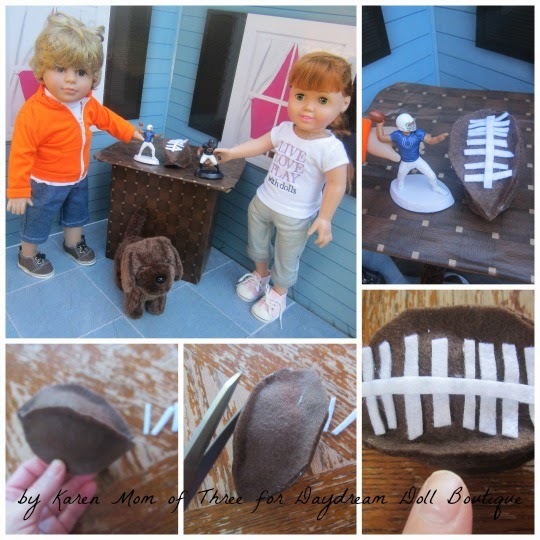 I look forward to sharing more doll play crafts and ideas with you soon.